A hot summer will mean wetlands dry out faster than ever, so how will pest mosquitoes respond? Once the warm weather arrives, you know mosquitoes won’t be far behind. Spring heatwaves associated with the impending arrival of El Niño to the east coast of Australia may mean we’ll get an early taste of summer, but what about mosquitoes? Does a long, hot summer mean fewer annoying buzzing and biting beasts bothering us whenever we spend time outdoors? Where do mosquitoes come from? Mosquitoes are complex animals. Like all insects, they thrive in warm weather, but they need more than just heat, they need water. Mosquitoes lay their eggs on or around water. Without it, they cannot complete their life cycle. Mosquito “wrigglers” hatch out from eggs and spend a week or so swimming about before emerging and flying off in search of blood. Depending on where the water is, whether it is wetlands, puddles or water-filled containers, different kinds of mosquitoes will be present. There are hundreds of different mosquitoes in Australia. Some like salty water, some like fresh. Some need pristine conditions while some will tolerate filthy water trapped at the bottom of a septic tank. Because mosquitoes rely on water, rainfall plays a critical role in determining how many mosquitoes will be buzzing about this summer. A hot, dry summer must mean fewer mosquitoes? The likelihood that an El Niño will bring drier and warmer conditions to eastern Australia this summer is increasing. The latest predictions from the Bureau of Meteorology are that there is a 70% chance an El Nino will occur this year, about three times more than usual. At first, this may seem like good news for those averse to mosquito bites, but don’t pack away the repellent just yet. While floods bring mosquitoes, and often outbreaks of mosquito-borne disease, drought will knock out almost all mosquitoes. It is true that the ongoing dry conditions across inland areas of Australia will ensure mosquito populations remain low, but that doesn’t mean mosquitoes will disappear completely. While a lack of rain will keep many wetlands dry, that isn’t the case for our coastal wetlands. Some of the worst pest mosquitoes in Australia are found in our mangroves, saltmarshes and sedgelands. Mosquitoes, like the saltmarsh mosquito, Aedes vigilax, love wetlands regularly flooded by high tides. The eggs of this mosquito, laid in moist wetland mud, survive long periods of dry conditions. Once covered by tides, these hatch, complete development within a week, and emerge in extraordinary numbers to fly kilometres away into nearby communities to bite and spread disease-causing pathogens such as Ross River virus. Not only have these mosquitoes found a way to survive without rain, they thrive in hot and dry conditions. Without substantial rainfall, the pools and ponds in the wetlands dry completely, killing off any fish or other aquatic predators, ensuring perfect conditions once the next series of tides comes flooding in. The arrival of El Niño may be bad news for lots of wetland wildlife, but it isn’t all bad news for mosquitoes. The saltmarsh mosquito, Aedes vigilax, is one of the most important pest mosquitoes in coastal regions of Australia and has adapted to thrive in hot and dry conditions. Much has been made of the impact of heatwaves on human health. It may also inadvertently increase health risks in metropolitan regions of Australia. A shortage of water increases the need to conserve and store water around the backyard. Unfortunately, that also means creating a home for mosquitoes. One of the most widespread mosquitoes in the country, a mosquito that has probably bitten almost every Australian, is the backyard mosquito Aedes notoscriptus. This mosquito is found in water-filled containers around the backyard, from drains and roof gutters to rainwater tanks and bird baths. While you’d think hot and dry conditions will impact this mosquito, think about the extra effort we’re taking to store water around the home. If your rainwater tank isn’t properly screened or you’re keeping uncovered bins and buckets around the backyard filled with water, you’ll be providing a home for mosquitoes. The debate about the impact of a changing climate on mosquitoes and mosquito-borne disease often focuses on the spread of tropical diseases into warming temperate regions. The truth is it may be the way humans respond to a changing climate through water-saving measures around the home that could increase mosquito impacts in urban areas. This also may bring a risk of exotic mosquitoes to our suburbs, which could transmit more serious mosquito-borne pathogens such as dengue, chikungunya and Zika viruses. While some parts of Australia will have fewer annoying mozzies this summer, don’t be complacent about taking steps to avoid mosquito bites. Choose and use the right insect repellents and reduce opportunities for mosquitoes to move into your backyard by covering up water-holding containers. 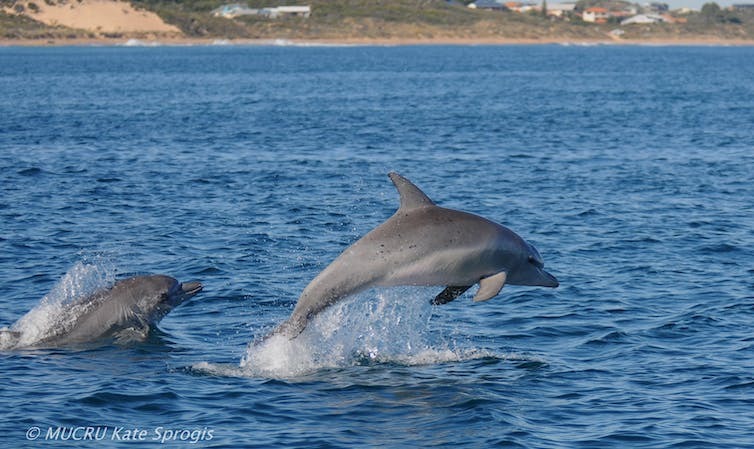 Indo-Pacific bottlenose dolphins (Tursiops aduncus) are a regular sight in the waters around Australia, including the Bunbury area in Western Australia where they attract tourists. 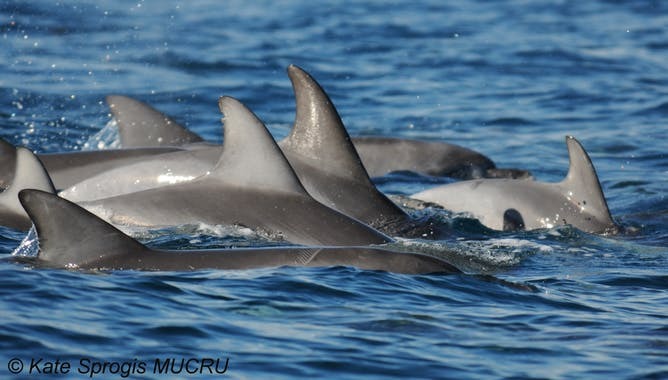 The dolphin population here, about 180km south of Perth, has been studied quite intensively since 2007 by the Murdoch University Cetacean Unit. We know the dolphins here have seasonal patterns of abundance, with highs in summer/autumn (the breeding season) and lows in winter/spring. 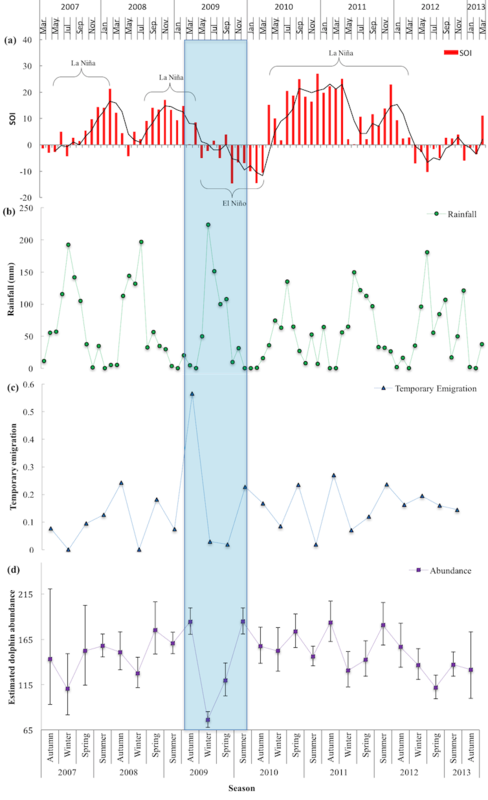 This decrease in numbers in WA could be linked to an El Niño event that originated far away in the Pacific Ocean, we suggest in a paper published today in Global Change Biology. The findings could have implications for future sudden drops in dolphin numbers here and elsewhere. The El Niño Southern Oscillation (ENSO) results from an interaction between the atmosphere and the tropical Pacific Ocean. ENSO periodically fluctuates between three phases: La Niña, Neutral and El Niño. During our study from 2007 to 2013, there were three La Niña events. There was one El Niño event in 2009, with the initial phase in winter being the strongest across Australia. The blue vertical line shows the decline in dolphin numbers (d) during the 2009 El Niño event. Coupled with El Niño, there was a weakening of the Leeuwin Current, the dominant ocean current off WA. There was also a decrease in sea surface temperature and above average rainfall. ENSO is known to affect the strength of the south-ward flowing Leeuwin Current. During La Niña, easterly trade winds pile warm water on the western side of the Pacific Ocean. This westerly flow of warm water across the top of Australia through the Indonesian Throughflow results in a stronger Leeuwin Current. During El Niño, trade winds weaken or reverse and the pool of warm water in the Pacific Ocean gathers on the eastern side of the Pacific Ocean. This results in a weaker Indonesian Throughflow across the top of Australia and a weakening in strength of the Leeuwin Current. The strength and variability of the Leeuwin Current coupled with ENSO affects species biology and ecology in WA waters. This includes the distribution of fish species, the transport of rock lobster larvae, the seasonal migration of whale sharks and even seabird breeding success. The question we asked then was whether ENSO could affect dolphin abundance? What happened during the El Niño? These El Niño associated conditions may have affected the distribution of dolphin prey, resulting in the movement of dolphins out of the study area in search of adequate prey elsewhere. This is similar to what happens for seabirds in WA. During an El Niño event with a weakened Leeuwin Current, the distribution of prey changes around seabird’s breeding colonies resulting in a lower abundance of important prey species, such as salmon. This in turn negatively impacts seabirds, including a decrease in reproductive output and changes in foraging. In southwestern Australia, the amount of rainfall is strongly connected to sea surface temperature. When the water temperature in the Indian Ocean decreases, the region receives higher rainfall during winter. High levels of rainfall contribute to terrestrial runoff and alters freshwater inputs into rivers and estuaries. The changes in salinity influences the distribution and abundance of dolphin prey. This is particularly the case for the river, estuary, inlet and bay around Bunbury. Rapid changes in salinity during the onset of El Niño may have affected the abundance and distribution of fish species. In 2009, there was also a peak in strandings of dead bottlenose dolphins in WA (between 1981-2010), but the cause of this remains unknown. Of these strandings, in southwest Australia, there was a peak in June that coincided with the onset of the 2009 El Niño. Specifically, in the Swan River, Perth, there were several dolphin deaths, with some resident dolphins that developed fatal skin lesions that were enhanced by the low-salinity waters. Our study is the first to describe the effects of climate variability on a coastal, resident dolphin population. A group of bottlenose dolphins. We suggest that the decline in dolphin abundance during the El Niño event was temporary. 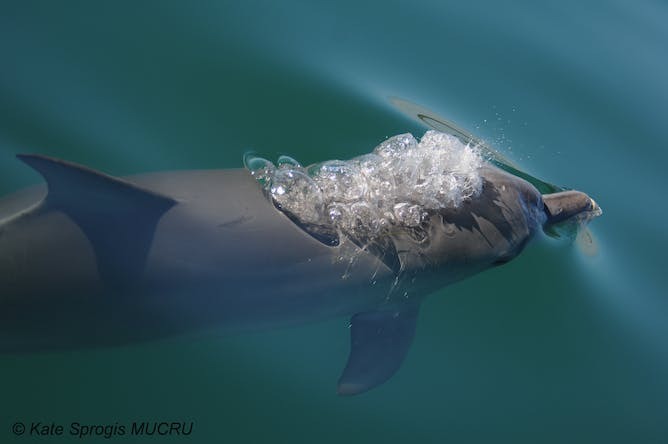 The dolphins may have moved out of the study area due to changes in prey availability and/or potentially unfavourable water quality conditions in certain areas (such as the river and estuary). Long-term, time-series datasets are required to detect these biological responses to anomalous climate conditions. But few long-term datasets with data collected year-round for cetaceans (whales, dolphins and porpoises) are available because of logistical difficulties and financial costs. 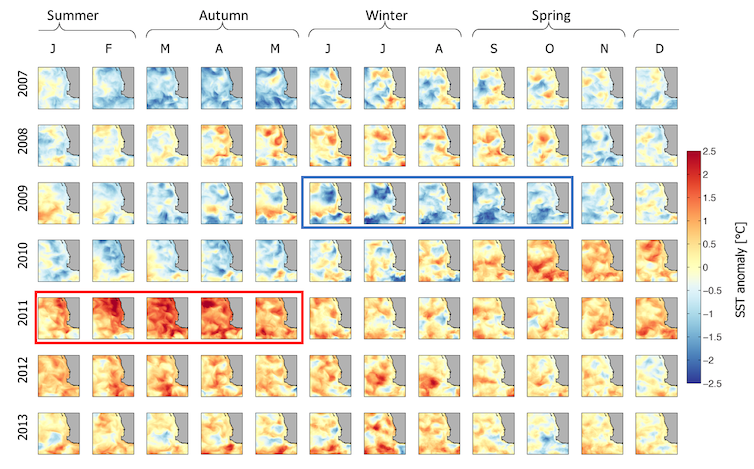 Continued long-term monitoring of dolphin populations is important as climate models provide evidence for the doubling in frequency of extreme El Niño events (from one event every 20 years to one event every ten years) due to global warming. With a projected global increase in frequency and intensity of extreme weather events (such as floods, cyclones), coastal dolphins may not only have to contend with increasing coastal human-related activities (vessel disturbance, entanglement in fishing gear, and coastal development), but also have to adapt to large-scale climatic changes. Despite these mysteries, we know that the IPO had an influence on the global warming “hiatus” – the apparent slowdown in global temperature increases over the early 2000s. Global temperatures are on the up, but the IPO affects the rate of warming. For Australia’s climate, 2016 was a year of two halves. The year started with one of the strongest El Niño events on record in place in the Pacific Ocean, and the opening months of 2016 were generally hot and dry, especially in northern and eastern Australia. From May onwards there was a dramatic change in the pattern, with heavy rain and flooding a regular feature of the middle months of the year. Overall temperatures were the fourth warmest on record in 2016, capping off Australia’s hottest decade. We track these events and more in the Bureau of Meteorology’s annual climate summary released today. At the start of 2016, many parts of Australia were significantly affected by drought. Long-term drought had existed since 2012 through much of inland Queensland and adjacent northern areas of New South Wales, while shorter-term drought affected Tasmania, central and western Victoria, and parts of South Australia. While some rain fell between January and April in these areas, it was generally not enough to have much impact on the rainfall deficiencies. Tasmania was hit especially hard, with low water storages restricting hydroelectric production, and long-lived and extensive bushfires in central and western parts of the state a feature of the summer period. 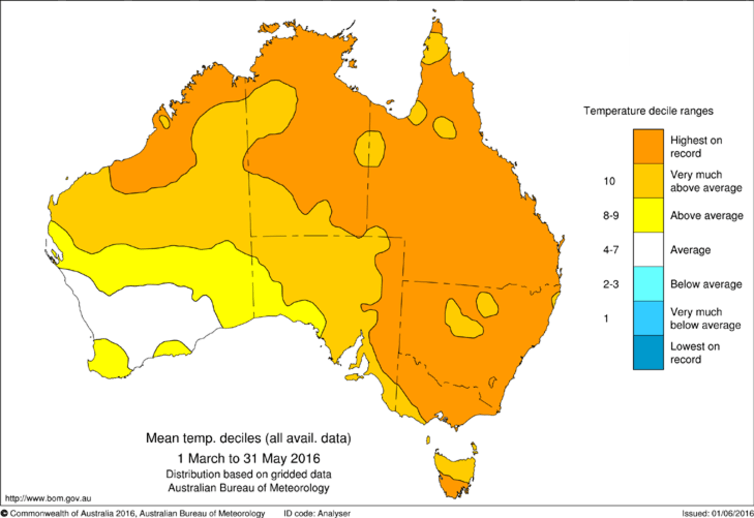 January to April, normally the wettest time of the year across Australia’s far north, was also much drier than normal with rainfall well below average in the Kimberley, the Northern Territory Top End, and on Cape York Peninsula. It was the least active Australian tropical cyclone season since comprehensive satellite records began in 1970, with only three cyclones in the region, none of them severe, and only one of which made landfall. Widespread heavy rains began in May – something well predicted by seasonal forecast models – as the El Niño ended and conditions in the Indian Ocean became very favourable for Australian rainfall, with unusually warm waters between Western Australia and Indonesia. Each month from May to September was wetter than average across most of the continent, with heavy rains extending into areas such as inland Queensland where the winter is normally the driest time of the year. The wet conditions culminated in September, when nationally averaged rainfall was nearly three times the average. It was the wettest September on record for New South Wales and the Northern Territory, and in the top four wettest for every state except Western Australia and Tasmania. May to September was the wettest on record over Australia, with some locations in inland New South Wales breaking previous records for the period by nearly 200 millimetres. Rainfall returned to more normal levels in eastern mainland Australia from October onwards, although Tasmania remained wet, and a tropical low brought widespread heavy rains extending from the Kimberley south through central Australia as far south as South Australia and Victoria in the year’s final days. Despite flood damage in places and some rain-affected harvests, the wet conditions were generally positive for agriculture. They also led to large increases in water storage levels in many areas, especially in the Murray-Darling Basin and in Tasmania. Flooding and storms were also a feature of this period. In early June, an East Coast Low affected almost the whole east coast from southern Queensland southwards. Northern Tasmania saw some of its most severe flooding on record, and the Sydney region suffered significant coastal erosion with some property damage. The heavy September rains led to major flooding on several inland rivers, particularly the Lachlan River in central New South Wales, and went on to produce the highest flood since the early 1990s on the Murray River in South Australia as the waters moved downstream. An intense low-pressure system in South Australia at the end of September caused major wind and flood damage there. In Tasmania, which had further flooding in November, the seven months from May to November were the wettest on record, after the seven months from October 2015 to April 2016 had been the driest on record. Over Australia as a whole, it was the 17th wettest year on record with rainfall 17% above the long-term average. Tasmania had its second-wettest year on record, despite the dry start, and South Australia its fourth-wettest. Below-average rainfalls in 2016 were largely confined to parts of the northern tropics, coastal areas of southern Queensland and northern New South Wales, and some parts of coastal Western Australia. Heavy rains in the year’s final week were enough to lift Adelaide to its second-wettest year on record, while Uraidla, in the Adelaide Hills, had the largest annual rainfall total at any South Australian site since 1917. It was the fourth-warmest year on record for Australia, with temperatures 0.87℃ above average nationally, 0.33℃ short of the record set in 2013. 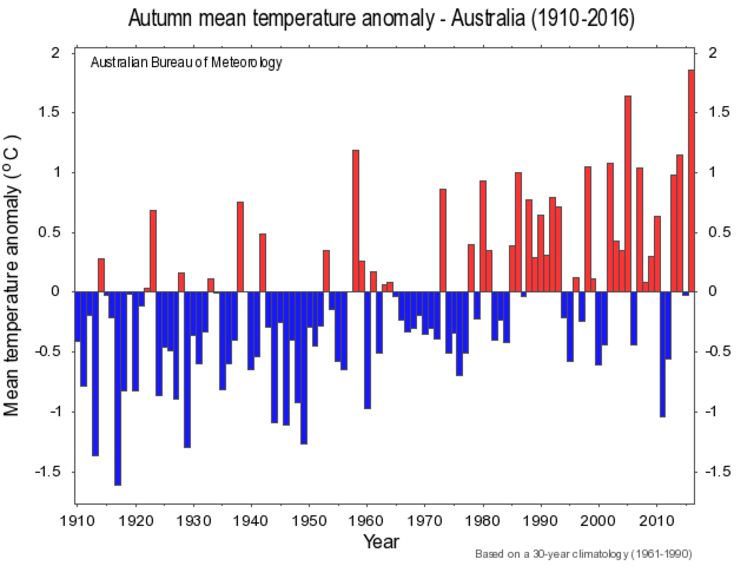 The year got off to a very warm start; it was the warmest autumn on record for Australia, and the first half of the year was also the warmest on record, although there were no individual heatwaves on the scale of those experienced in 2013 or 2014. The second half of the year was less warm. During the wet months in mid-year, heavy cloud cover led to cool days but warm nights, then a cool October resulted in spring temperatures almost exactly matching the long-term average. A warm start and cooler finish is typical of a post-El Niño year as rainfall typically changes from below to above average. It was the warmest year on record in many parts of the northern tropics, along much of the east coast, and in parts of Tasmania. Darwin, Brisbane, Sydney and Hobart all had their warmest year on record. The warmth on land in these coastal areas was matched by warmth in the oceans. Sea surface temperatures in the Australian region were the warmest on record, with the first half of the year especially warm. The record warm waters contributed to extensive coral bleaching on the Great Barrier Reef, and also affected fisheries in Tasmania. Temperatures were closer to average in other parts of the country, including inland areas of the eastern states, South Australia and most of Western Australia. In a few parts of southern Western Australia, which had its coldest winter since 1990, temperatures in 2016 were slightly below average (one of only a handful of land areas in the world where this was the case), and there was some frost damage to crops in what was otherwise a very productive year for Australia’s grain-growers. 2016 continues a sequence of years with Australian temperatures well above average. While 2016 did not set a record, the last four years all rank in Australia’s six warmest, and the last ten years have been Australia’s warmest on record. 2016 is also almost certain to be the hottest year on record globally.